The Palouse is the most serene and pastoral of the seven wonders of Washington State. It is a region in south eastern Washington characterized by gentle rolling hills covered with wheat fields. The hills were formed over tens of thousands of years from wind blown dust and silt, called "loess", from ﻿dry regions to the south west. 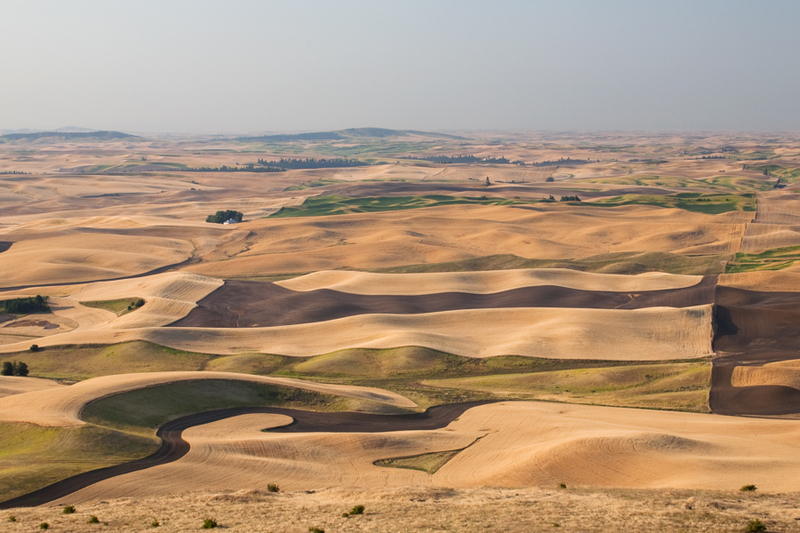 Seen from the summit of 3,612 foot high Steptoe Butte, they look like giant sand dunes because they were formed in much the same way. In the spring they are lush shades of green when the wheat and barley are young, and in the summer they are dry shades of brown when the crops are ready for harvest. The Palouse hills are not only a landscape unique in the world, but they are beautiful to behold, making them my favorite of the seven wonders of Washington State. 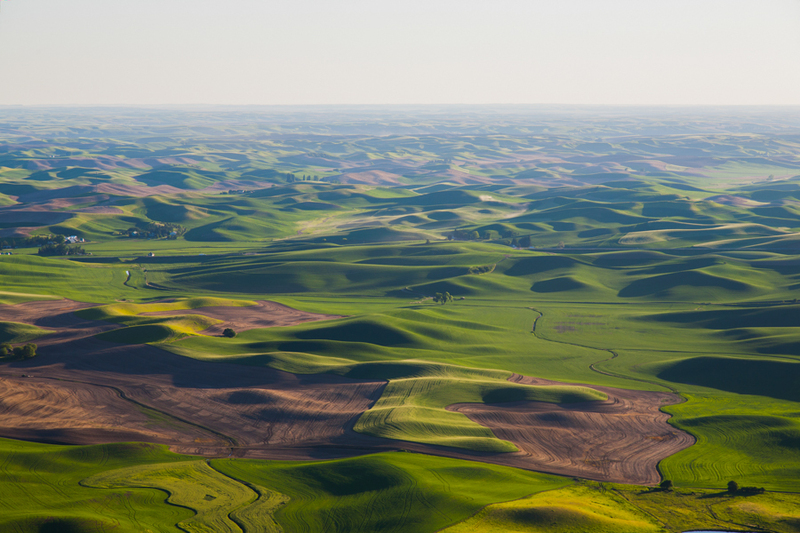 The fact that the Palouse hills exist at all is somewhat of a miracle. During the last several ice ages, glaciers advancing south from Canada ground up the bedrock as they passed over it, creating a fine rock dust known as glacier flour. The glacial flour washed out from the glaciers and accumulated in Glacial Lake Missoula (see The Channeled Scablands chapter). The Missoula Floods washed over eastern Washington and created several huge but temporary lakes. These lakes eventually drained and left behind monumental quantities of silt. Prevailing winds from the south west blew in the silt and dust to where it settled out into hills of loess that look like giant sand dunes. Productive as the hills of loess were for the farmers, they also posed a serious problem. Some of the hills in the Palouse are steep enough to cause tractors and combines to tip over. Dryland farming requires the land to be plowed along the contours of the hills, not straight up and down the slopes. The solution was created by Raymond Hanson in 1941. During the time period that he was farming in the Palouse when we was only 19 years old, he invented the control mechanism that lead to the development of self-leveling combines. 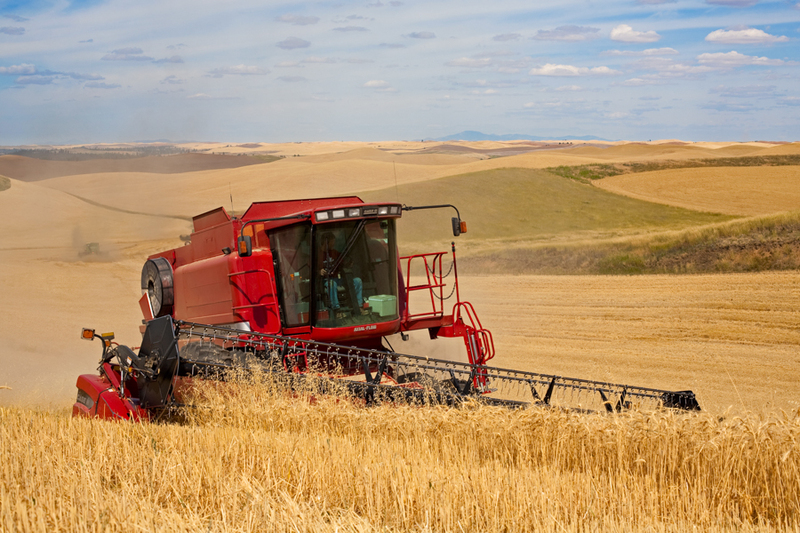 Self-leveling combines allow the combine's chassis and header, (the front part that cuts the wheat), to follow the slope of the hill, while the cab and body remain vertical. Combines such as this one can cut 100 acres of wheat in a single day. 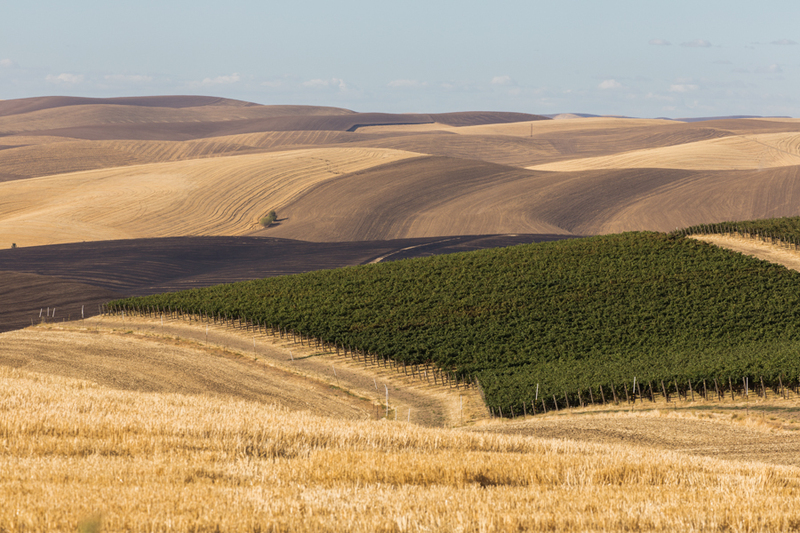 A relatively recent development in the southern area of the Palouse near Walla Walla is the appearance of vineyards. In 1972 there were exactly six wineries in Washington State. As of 2015 there are over 800. The same climate that is ideal for wheat is also great for growing grapes, with Cabernet Sauvignon being the leading varietal. The area of the Palouse from Colfax south to Waitsburg lies within the boundary of the Columbia Valley AVA, and the area further south is within the Walla Walla Valley AVA. An American Viticultural Area (AVA) is an official US government designation for wine growing regions based on distinctive geographic features, climate, soil, and elevation. The two AVA's within the Palouse have the same latitude as the Bordeaux wine growing region of France. The photographs and information about the Palouse shown here are just a sample from the book, The Seven Wonders of Washington State, which is available for purchase via the Buy Now link at the bottom of the page. The marker on the map shows the location of Steptoe Butte. You can see more photographs of the Palouse and purchase fine art prints at ﻿WashingtonPhotographs.com﻿.